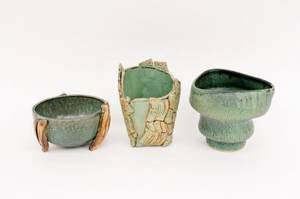 Group of three Ching Wen green glazed ceramic table vases including a pot with curved triangular opening at top above a soft billowy body with crackled patina; a table vase with lighter green glaze with applied wavy bark or rock forms in three vertical striped groups on the exterior; and a bowl form planter with dark green glaze with three appled bone or tree branch form legs. 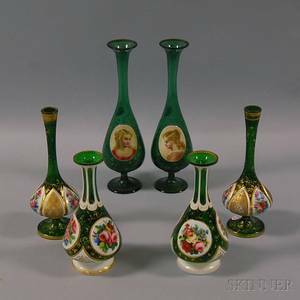 All signed on bottom "Ching Wen". 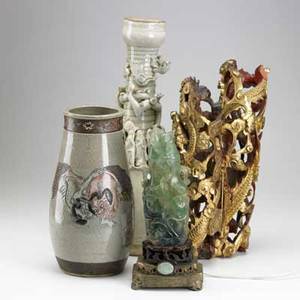 One with additional character mark within circle on exterior of vase. 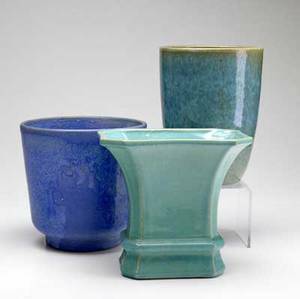 Height of bowl form planter (with hole at bottom for drainage) 3.9". 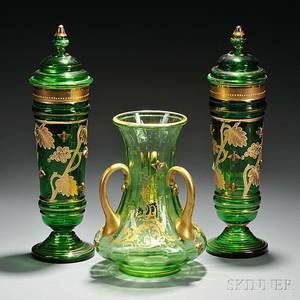 Height of vase with applied ornament 6.75". 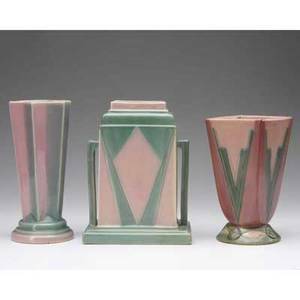 Remaining vase with triangular top height 5.8". 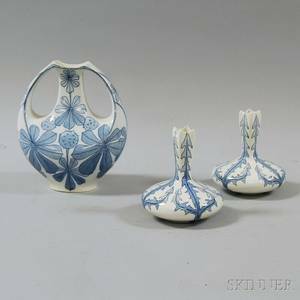 Three Assorted Asian Glazed Ceramic Vases and Two Small Chinese Export Carved Hardwood Stands. 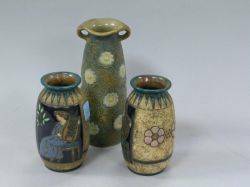 Galloway three ceramic vases covered in blue and green glazes. all marked. 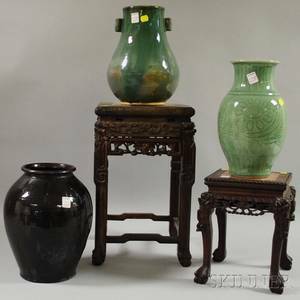 heights: 7 1/4" and 8"
Decorative asian grouping; green quartz lamp, pair of cylindrical wood carvings, and two glazed ceramic vases, 19th/20th c.; tallest: 19"